Water supply to around seven lakh people in Siliguri has been affected for the past five days because of shifting of pipes for the construction of Asian Highway II and a subsequent breach in one of the ducts. "The state PHE department had said it needed to shift pipelines which connect our water reservoirs with the treatment plant at Fulbari. The shift was for the Asian Highway II as the existing road was being widened and pipelines were parallel to it. 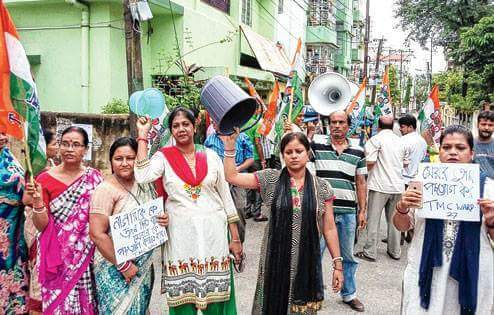 Officials of the PHE department had said they needed two days, that is September 8 and 9, for shifting the pipes further," Saradindu Chakraborty, the member, mayor-in-council (water supply) of the Siliguri Municipal Corporation, said yesterday. "They had finished the task and water supply resumed yesterday afternoon. However, soon, the line from the treatment plant burst at a bend because of pressure. The supply was halted again and the PHE authorities said it would take some time for the repair," he added. In Siliguri, water is drawn from the Teesta-Mahananda Canal and brought to the treatment plant. Water flows from Fulbari to 15 overhead tanks and four underground reservoirs at different places of the town through a network of pipelines which are maintained by the PHE. From the reservoirs, another network of pipes carries water to all 47 wards. The daily requirement of water in Siliguri is around 55 million litres but on an average, the SMC can provide only 44 million litres. The halt in the water supply has left thousands of household dry. "A section of old apartments and houses have wells and their occupants have no problems. But those without wells are bearing the brunt of the crisis. There is acute water shortage in commercial buildings," said an SMC official.